The number of Barney merchandise in our abode has unknowingly proliferated over the past 10 months or so. 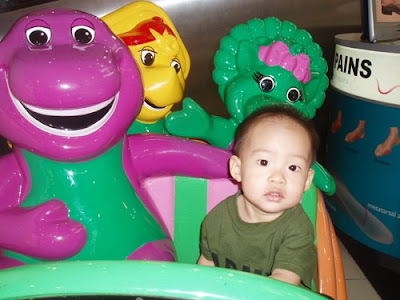 We have Barney soft toys ranging from giant size to mini size, we have a collection of about 20 Barney VCDs, we have Barney dining set, we have Barney bolsters, we have Barney water bottle, which leaks forever, may I add. Barney is filling up our spaces and appearing in every nook and cranny. We eat with Barney, drink with Barney and now I somehow start to smell like Barney! All in all, I hereby announce, the invincible Barney has invaded our abode and also both of our cars. Well, that probably revealed the obsession of the little boy of our house. 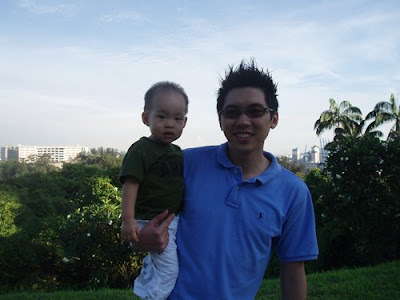 Ziv simply adore Barney, an ardent fan he is. Some may say, “How obsess can a kid get?” I can tell you, never underestimate kids. Cause I have experienced it. There was once around 4am, Ziv woke me up, showed me his mini Barney and pointed to the TV set, obviously he WANTED Barney. 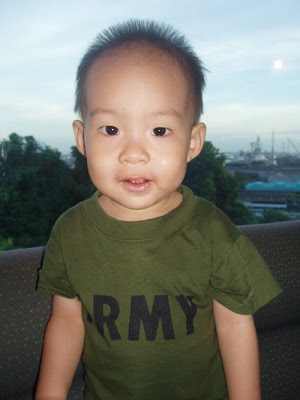 Once we decided to give in to his request since he could not sleep, we turned on Barney and he watched from 630am to 8am. Both Kevin and I were soundly asleep during that period. Scary isn’t it. 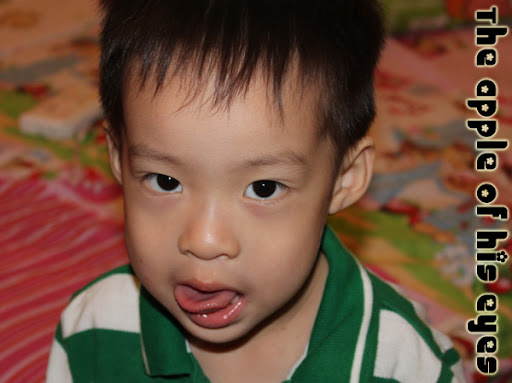 Kevin always foolishly predicts, “I think Barney will control the world some day.” And I always refute that. “That only happens in Hollywood flicks!” I assured him. 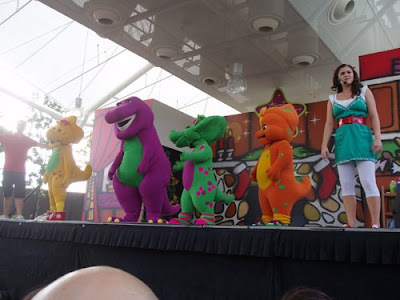 Foolish as it may sound, well not until today, when I went to IMM to catch Barney performance and I thought, it might happen…. These kids really freaked me out! “Barney! Barney! 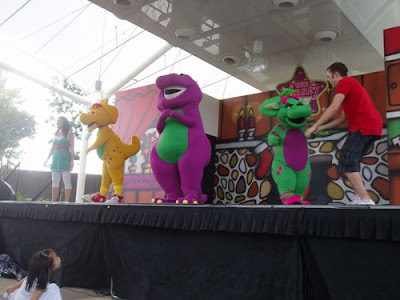 Barney!” demanded an 8 year old boy who could not seem to wait for Barney to appear on stage. This was what happened today. Kids wearing Barney shoes, tshirts, and the water bottles seemed to be the staple item for all! And Ziv has it. 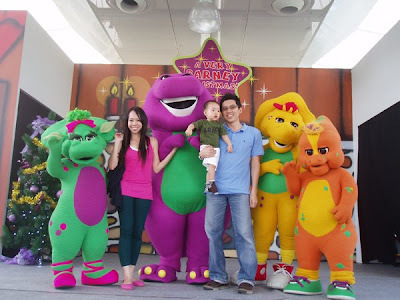 There was this photo taking session with Barney limited to only 30 lucky ones. When I reached the stage area about 30 minutes prior to the show (thanks to my “informant”, Emily) the queue already started to form and it seemed that even if I joined in the queue, I would never be within the 30 of them. Nevertheless, I still opted to join, I have been transformed into an infatuated fan and it reminded me of when I was a teenager, gaga over Edison Chen, queuing up for his signature. In the midst of the ticket distribution, one mother in front of me left the queue, and guessed what?! I was the 30th lucky one! 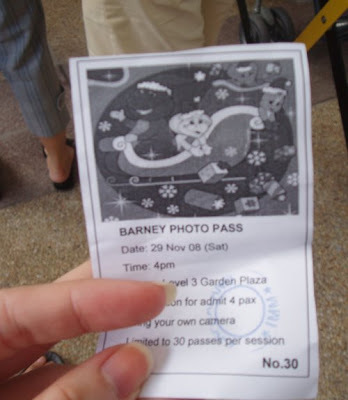 In the queue, I even contemplated to pass the ticket issuer a 100 dollar note to tell her, please let me take a picture with Barney. I admit that was absolutely insane. Can you imagine the look of the 31st mother? She was from China and before I could slot the money into the box, her hand emerged from behind and attempted to put her money in the box before I did. I gave her a “are you a moron” look cause what was the woman thinking? Slotting her money into the box will ensure her a ticket? Dream on, Freak! I counted myself very lucky. Here are some pictures taken during the performance. Kevin and I laughed at Ziv's hands. Haha... he is like an adult! 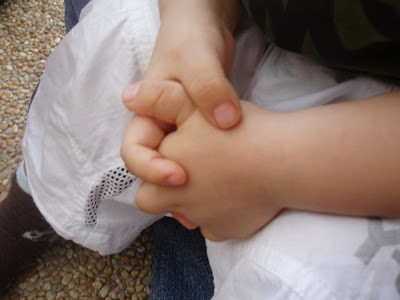 We called it "concentrated hands". The photo taken. 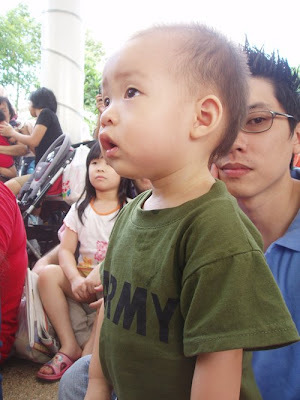 Unfortunately Ziv is not looking at the camera. Must be too upclose and personal with his idols that he needed to double check on them. How about a Barney ride after the show? After the show, we left IMM and went to Hilltop for Teppanyaki. Ziv was exceptionally delighted probably because of the Barney show. 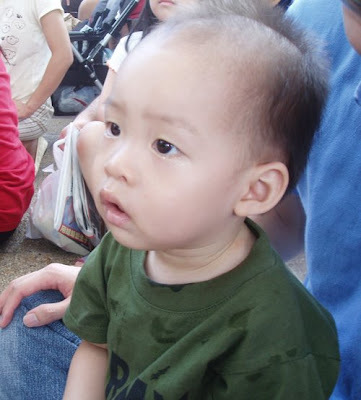 He ate lots of salmon and rice and baby talked throughout shopping and meal times. All smiles... after salmon and rice. Ziv has a unique dance number each time he hears a groovy music. And most of the time, we were too fascinated by his 'hidden' talent and so very often, the video shoot came too late to capture those funny moments. Till date, we have yet to capture a complete dance number performed by him. On Sunday, I managed to capture a fair bit of what is left (unfortunately) after a wild, wacky and exhausting boogie to the ending music of the animated movie, "Madagascar". Anyway, I totally have no idea on how to rotate the video to 90 deg clockwise. Maybe someone can enlighten me.